We must always have bacon on hand at our house. It goes in so many dishes, and is so good on its own. I have been making my own bacon for decades. Of course, homemade bacon tastes much better than store bought types. And, with homemade bacon, you can completely control the flavor to your own tastes or make bacon specifically tailored for certain uses. I use bacon in BLTs, cassoulet, choucroute garnie, as a pizza topping, or just to eat plain with my breakfast eggs. Making homemade bacon is easy. All it takes is good quality pork bellies and time. The other ingredients are simple and easy to find. 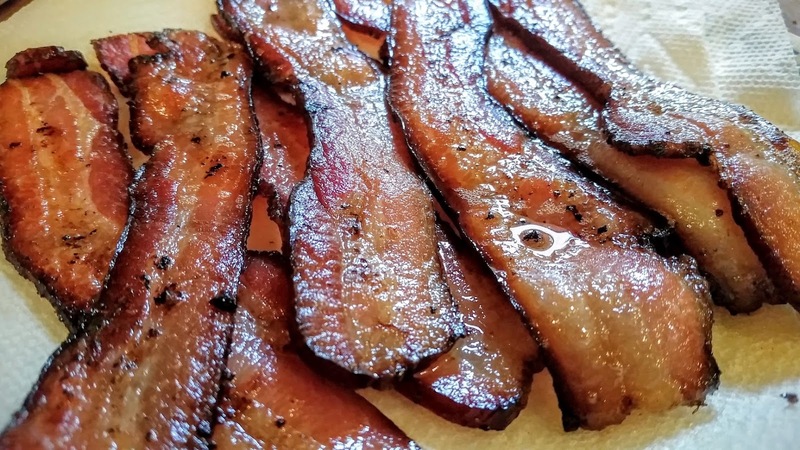 The internet abounds with recipes to make bacon. I have tried a few of them, and they usually come out way too salty. Fortunately, I discovered how to make an equalization cure. With this type of cure, the salt is measured as a percent of the weight of the meat. This prevents the meat from becoming too salty if it is left in the cure too long. In fact, with an equalization cure, it is better to leave the meat in the cure for a longer time to ensure the cure fully penetrates the meat for an even curing. The equalization cure also makes sure the nitrite level is kept at a safe level. I know some folks are concerned about nitrates and nitrites in their cured meats. The fact is that these are natural substances in many of the foods we eat every day. Like everything else, moderation is key. A lot of so-called uncured meats use celery salt instead of nitrite. Guess what? Celery salt is high in sodium nitrite! The first step to make bacon is to find some good quality pork belly. Costco carries vacuum packed pork bellies, and they will make a usable bacon. For this bacon that I am making today, I got some heritage Berkshire pork bellies. 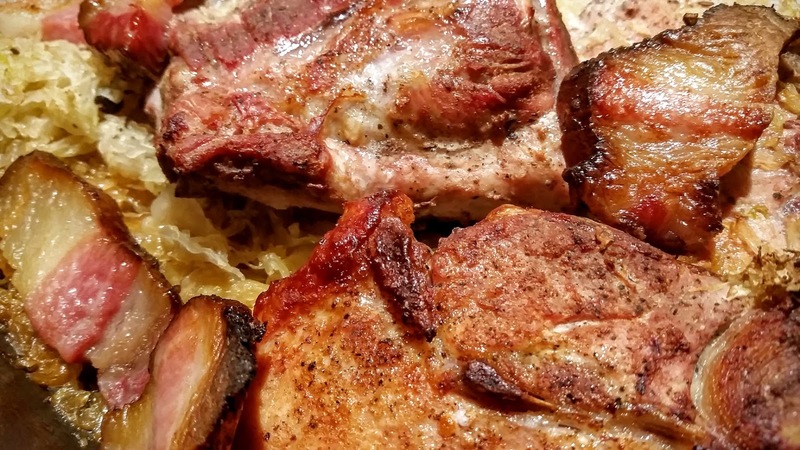 Pastured pork has darker meat and is more marbled. Certain breeds, like Berkshire, will grow a thicker belly making the slices of bacon wider. The difference in taste and quality is there, and if you’re going to spend the time to make bacon, make it as good as it can be. Remove the bellies from the packaging, rinse with cold water and pat dry. If there are any bits of bone or glands on the bellies, trim them away. I make each belly as a whole piece; you can cut yours into smaller pieces if it’s easier for you. Weigh each belly. A scale that uses kilograms is best to help with percent calculations. Foe each piece, set out a bowl for the salt and spices. Start with 2.5% of the weight of salt and 0.25% cure #1 for each piece. (Cure #1 is sodium nitrite.) Next add whatever other flavors you desire. I added a large amount of coarsely cracked black pepper to mine. Some folks like juniper berries, herbs, chilies, whatever you want. Place the pork into a large seal-able bag that will hold it completely. Sprinkle the salt mixture into the bag to make sure all surfaces are completely and evenly coated. This is important. Next, I like to add a bit of sweetness. I usually add some of our backyard honey into the bag. Today, I used some good maple syrup. It doesn’t take a lot. Maybe ½ cup to cover each belly. Stick your hands into the bag and rub the syrup (if using) all over the meat. Squeeze all the air from the bag and seal it up. Place the bag in the refrigerator. Flip the bag every day or two to make sure the brine it makes is evenly distributed. Continue this for about two weeks. After the curing period, remove the bellies from the bags and rinse thoroughly with cold water. It’s ok if some spices are still clinging to the meat. Pat the meat dry with paper towels and place on a rack set in a tray to catch any drips. Place the tray, uncovered, into the refrigerator for 24 hours. The surface of the meat will dry. This is called a pellicle, and it will help it take up the smoke more cleanly. Prepare to cold smoke. 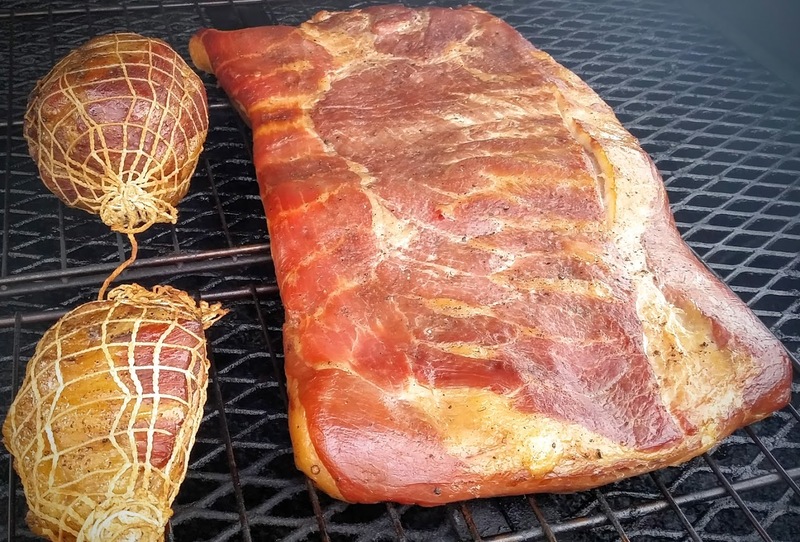 Cold smoking is done at temperatures around 100F. It can be as low as 70F and as high as 120F for bacon. It’s OK if the temperature slips out of range for a small bit of time. I use the Porkulator for cold smoking (as well as the normal hot smoking). To do this, I light a small fire in the fire box to get some coals going. Then I just get one log at a time burning. It will burn slowly, almost like a smolder, but it will stay burning and produce nice, blue smoke. Two 15-hour sessions provide the color and flavor I want. 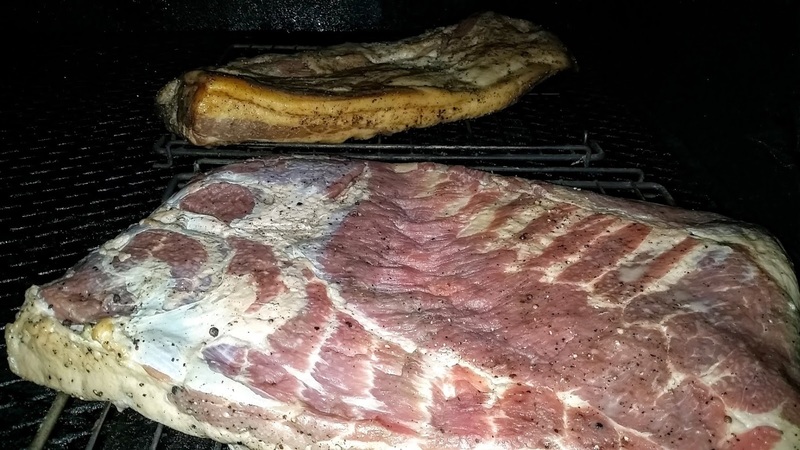 Typically, I will just start the smoking one day, leave the bacon on the smoker overnight as the fire dies out, and then start it up again the next day for another session. There are many cheap and easy cold smoking setups available on line these days, so If you don’t have a smoker capable of cold smoking now, do a little research and you can set yourself up in a jiffy. You can rig something up with a simple cardboard box! The next step is to let the bacon dry out a bit. I do this by placing it back into the fridge on racks to allow air to circulate around it. About 10 days does the trick. Now it’s ready to eat!